Aerial view of Temple Towers with SWMM model. An unused pool and lounge area behind Temple Towers is the focus of on Temple Engineering senior design team's project. This involves working with water, but not for recreation. Rather, their focus is designing a stormwater management area. Managing storm runoff can be tricky, particularly for urban environments. And Philadelphia has what's known as a combined sewer system, designed to collect rainwater runoff, domestic sewage, and industrial wastewater in the same pipe. This means that, unchecked, stormwater runoff can overwhelm the syste m.
According to the Philadelphia Water Department, Philadelphia experiences about 65 rainfall events each year. From that, the Office of Watersheds estimates that annual combined sewer overflow discharge is about 16 billion gallons. The team—civil engineering majors Amanda Dube, Stephen Colombo, Melinda Pfister, and Erik Sison—is advised by Civil Engineering Associate Professor of Instruction Rob Ryan. They entered a nationwide contest sponsored by the Environmental Protection Agency, that challenged students to design site specific implementation of green infrastructure for a shot at cash prizes. 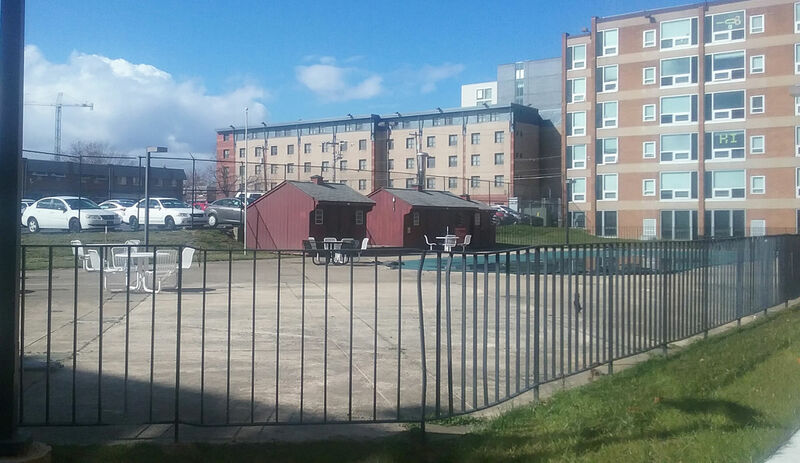 "It's an unused parking lot and pool," Dube said, of the site pictured here. Colombo added that the team aimed "to bring that space in-line with Philadelphia Water Department codes and also make it esthetically pleasing." A finished site would help to better manage the flow of stormwater, and though the design component is not part of this project's scope, stormwater projects typically involve elements like permeable pavement and other landscaping and horticultural elements to blend into the environment to create a functional green space. The PWD and Philadelphia Industrial Development Corporation award more than $15 million annually in grants to help offset the cost to design and construct stormwater retrofits on nonresidential properties in the city. The team worked with the university as part of a larger application for grant assistance and, though it wasn't awarded, Dr. Ryan noted that future teams could pick up this work and finish the job. "It gives them a tremendous leg up, career-wise. What they're doing is exactly what they'll be doing when they go out and start working," Dr. Ryan said. "They're using the same models and data. Whether this gets built or not, it's not a toy project."